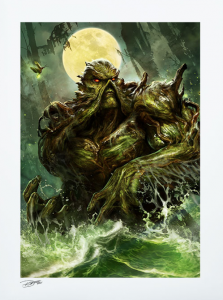 Featuring Swamp Thing, this stunning Sideshow exclusive art print is limited to only 250 produced, of which this is number 72 (1972 being the first year the Swamp Thing title was launched by DC Comics). The print is sold out from Sideshow! It measures 18 by 24 inches, is a fine art giclée print with embossed seal of authenticity and is signed by hand by the artist, Dave Wilkins. New and undisplayed in nm/mint condition, it will be shipped with the utmost care.